View of the Pass' main tower from below. 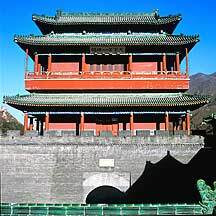 The Juyong Pass is one of the 3 great passes of the Great Wall. The other two are 山海关Shanhai Guan in the eastern terminus ending before the 渤海Bohai sea, and the 嘉峪关Jiayu Guan in the western terminus ending in the desert. 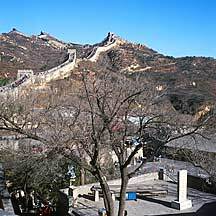 Badaling is the best restored section of the Great Wall. 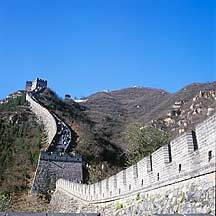 But due to the tremendous number of visitors, other sections of the Great Wall in the Beijing areas are on the rush to be restored to relief Badaling's load. In the foreground is Mao Zedong's calligraphy of the aphorism,"you are not a good Han(or person) til you have seen the Great Wall" inscribed on a tablet. Interior of a watchtower. These watchtowers were used for food and weapons storage,including cannons. But the main purpose of most parts of the Wall outside the vicinity of the passes were for signalling. The soldiers of these watchtowers sent back information on enemy sizes and speed back to the passes and the capital.